Ready! Present Bibles! A Prayer of Forgiveness. Begin! The children quickly open their Bibles to Psalm 51, place their fingers on the passage and step forward. 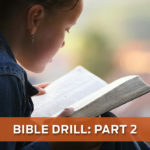 The caller states, “Number 3,” at which time child number three states, “A prayer of forgiveness, Psalm 51.” The caller states, “Thank you,” and each of the children step back and the drill continues. If you have never watched children participate in Bible Drill, you have missed a blessing, as well as a challenge. How well can you memorize 25 Bible verses and references, 10 key passage titles and references, and locate them in your Bible all within 10 seconds? Could you do the same? Can you name all 66 books of the Bible in order? If not, maybe you should participate in Bible Drill. Every year, I am amazed at the skills our children are learning by participating in Bible Drill. Not only do the children learn Bible verses, they learn how the verses apply to their lives. My oldest daughter is now in her fourth year of Bible Drill. 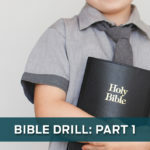 Having participated in Children’s Bible Drill, Paige has moved to the youth drills. Moving from 10 seconds to 8 seconds to locate Bible books, key verses, and key passages seems to be a bigger mental challenge than I thought, but as we practice each day, I see Paige getting stronger in locating the passages. I also she her recalling the verses when she faces challenges at school and with her friends. Now, Paige has to work a lot harder to memorize the verses, but because of this she knows the meaning and application of the verses better than some who can read and quote the verses without much thought. My younger daughter, Carrington, is just beginning her Bible Drill experience. The first week, she went into practice ready and eager to learn. The next week, she had memorized half of the verses and was ready when her teacher asked her to quote a verse. I have watched Carrington sing the verses and use what she is learning in Bible Drill during worship on Sunday morning. She is my competitive child and always ready for a challenge. Locating any book in the Bible in less than 8 seconds has become her goal (Children’s Bible Drill allows 10 seconds). 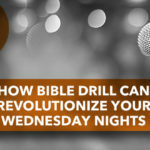 If your church does not have Bible Drill, let me encourage you to check with your associational office for information on beginning Bible Drill. I promise you, it is a ministry well worth the time and effort.